Question: How does a rainbow get created? If sunlight light passes through a prism, it will be split into the colors of the rainbow. We think other types of light (tungsten, white LED, and red and green laser) will not have the same color spectrum. Watch us in action: This is what happens when you shine a bright light through a prism. Light separates into different colors because of refraction and dispersion. 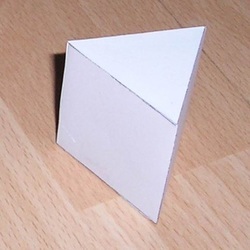 Refraction is the bending of light when it travels from one material to another. Dispersion is the separation of light into different colors after it is bent base on it's wavelength. Since Red has a longer wavelength, it bends the least. Violet has the shortest wavelength so it bends the most. When we put the prism into the sunlight, we found a lot of all the colors as you see in the pictures. As we moved further away from the prism, we saw more color separation (or dispersion). After this experiment we noticed that when you shine other kinds of light into a prism it breaks down into different colors. Sunlight had the greatest color separation, or dispersion. It had the most vibrant color. We found tungsten had all the colors, but more of Yellow, Orange, and Red. White LED only had Yellow, Red, Green and some Indigo. The laser pointers only showed the one color of light (red or green). I am 10 years old and I love to play soccer and I love cookies!!! I am 10 years old and I am in 5th grade and I love to be artistic. I love to play with my neighbors. I spend time with my family. I love the snow.